My earliest memories of eating scones were at my Grandmother’s house. Granny’s house was my favourite place on Earth, not least because we always had afternoon tea and afternoon tea was a meal of cakes. Whether it was a hang over from the days of taking tea between surgeries when my Grandfather was practicing medicine or from an earlier era I don’t know. All I do know is that there is something rather special about having four meals in a day. It wasn’t until pregnancy that I began to appreciate jam and cream (I know); the rich and sweet combination is a real treat for the senses. Clotted cream always has to be Roddas – packaging and contents a true classic delight. We make these at children’s birthday parties to hand out to the parents. Often I’m rubbing in an hour before we are due to start making them warm and moist when we slice into them. Despite what you may think, scones are incredibly simple to make and a fast bake so perfect for unexpected guests or emergency pick-me-ups. I prefer sultanas for their plumpness but you could happily use raisins if you don’t have sultanas in. I tend to use buttermilk if I have it or a mixture of milk and yoghurt but you could easily use milk when making these. I love the hiss they give off as you press the cutter into the dough. 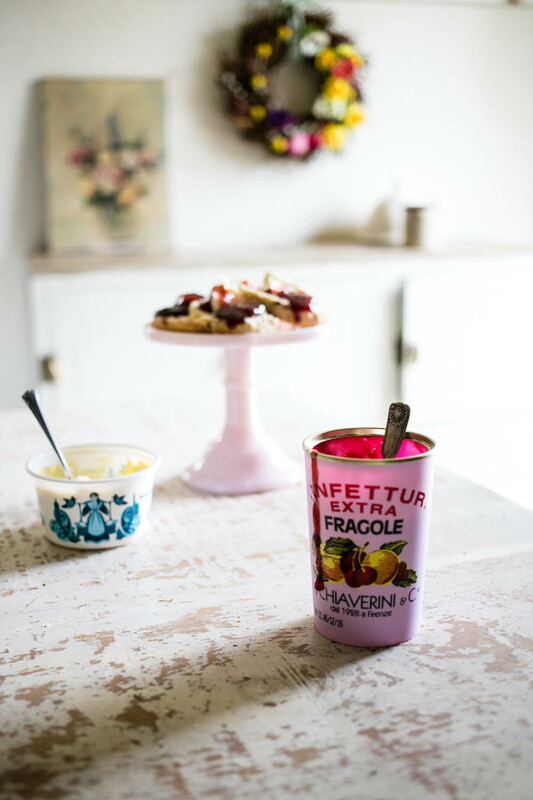 I took these pictures on my April trip to Walnuts farm and the gorgeous cake stands and Italian jam are from The Hambledon who hooked me up with props for the day (love them to bits for this). Makes 12 – 20 depending on the size of your cutter! Sift your flour, baking powder and salt into a large mixing bowl. Add the cubed butter and rub it in lightly with your fingertips until you have a mixture like sand. I like to hold my hands high above the bowl as I do this to add air into the mixture. Add the sugar and fruit and stir through to combine. Stir in the buttermilk, a little at a time, using a palette knife. You are aiming for a sticky dough and depending on the weather you might need more or less of the liquid. Flour your surface and turn out your dough. Roll it gently until it is about 2.5cm/1 inch thick. Cut your scones from the dough with a floured pastry cutter, re-rolling the dough to get as many as you can. 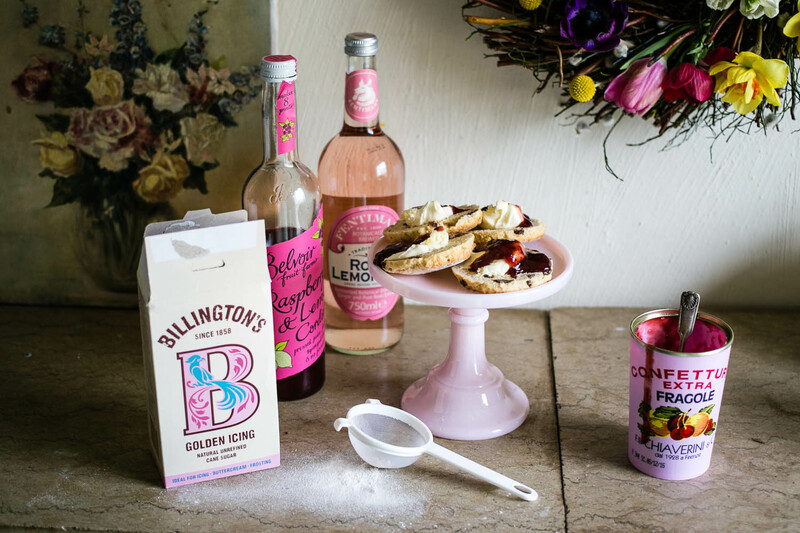 Flour a baking tray and transfer your scones to the oven. Bake for 8 – 12 minutes, keeping an eye and a nose on them, until they are golden brown. There is a tipping point between golden brown and bitter burnt tinge with sultanas so please stay close to the oven when baking these. Cool on a rack and eat warm with lashings of butter or jam & clotted cream. 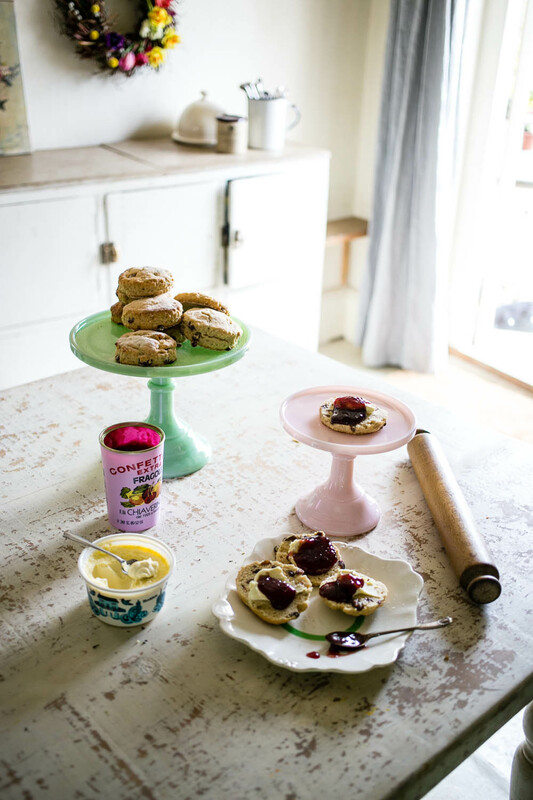 Wanted you to know that I made these this afternoon…I haven’t cooked scones since gcse food tech! They were brilliant, thanks for the inspiration !